Arriving at Redhill on 10 May, the distinctive 'thump thump' noise of a Huey was assaulting the aerodrome from, it seemed, every direction. Good news for UK airshow-goers - and, as it turned out, good news for the aircraft's owner too. served until 2000, mostly with the Air National Guard. Retired to storage at AMARC in August of 2000, three years later it was dusted off and a full restoration was begun by Bryan Reynolds and his team. Once that was done the matter of an export licence was next - it is no easy matter to get a military helicopter out of the USA these days! After two years of work the Huey was successfully test flown, and then, export licence having been acquired, it was disassembled and transported to the UK inside a 747. Huey '509 then entered combat once more. While being put back together at London Helicopters at Redhill, the first shots were being fired in a battle with the dead hand of bureaucracy. 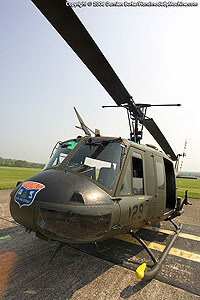 Thankfully, there was at least a precedent for the operation of a UH-1 in civilian hands - the Royal Air Force Benevolent Fund operated an ex-Argentine example as G-HUEY in the 1980s. That, and a sudden breakthrough from more enlightened souls at the CAA's Standards Division found me at Redhill watching owner Phil Connolly and chief pilot Neil Airey putting the Huey through her paces for the first time in seven months. All went well, and as well as the aircraft having successfully negotiated the transfer from a US 'N' registration to a UK 'G' registration, both Phil and Neil successfully ticked all the boxes to be awarded their essential paperwork - a type rating for a single engined Huey. Neil is an ex-RAF pilot with thousands of hours on helicopters, including nearly a thousand on 'Huey' types such as the Bell 212 and Griffin . He currently flies as a Bolkow 105 performing air ambulance duty. Phil is a businessman involved in diving equipment and was bitten by the flying bug at an early age, but did not learn to fly until 1998. Since gaining his PPL he has moved on to helicopters and after a flirtation with Gazelles has now realised his dream of owning and operating a Huey. With the administrative hurdles overcome, we can look forward to seeing 'Miss Jo', as this Huey is named (after Phil's wife), on the airshow circuit this year - initially as a static exhibit but hopefully soon as a flying participant - Neil is working on the display routine and his display authorisation. Fingers crossed we see much more of Miss Jo... er... the helicopter, I mean! 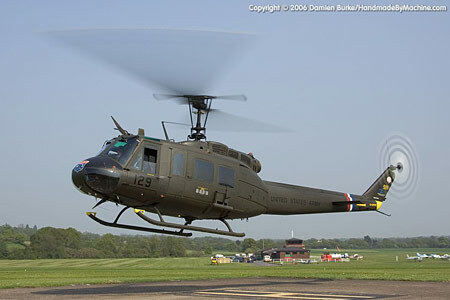 To book an appearance from the UK 's only airworthy UH-1, get in contact with Phil via the Huey website . The Bell company put forward the model 204 as multi-purpose helicopter for Army use in 1955. First flown in October 1956 as the XH-40, nine pre-production examples were designated the HU-1 (for Helicopter, Utility) and were inevitably nicknamed 'Huey' ( BELL and HUEY are now stamped on the rudder pedals). The UH-1A production model first flew in 1959 and they first saw active service in Vietnam in 1963. Attrition was fierce, with over 2,500 Hueys lost in the combat zone - around half to accidents and half to enemy action. More than 10,000 Hueys of various marks have been built, and continue to be manufactured to this day as the considerably upgraded twin-engined (and four bladed) Agusta-Bell AB-412. 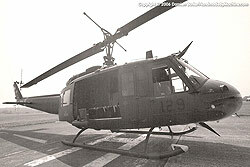 The ubiquitous UH-1H model (officially named the 'Iroquois') was the most numerous of all the models, and was built from 1967 to 1986. 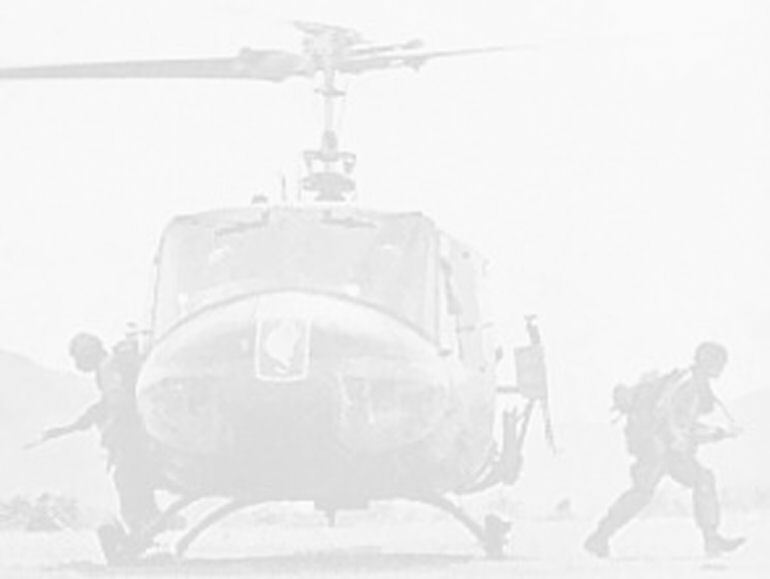 The US Army replaced their UH-1H models with UH-60 Blackhawks from 2004 onwards but other models of the Huey continue in military service - including with the US Marine Corps.